Royal Commission Survey of Cambridge 1959: houses, nos. 1 to 24, excluding nos. 13 and 15, and no. 29a Trumpington Street, consisting of two terraces on the N and S sides of Fitzwilliam Street… are contemporary and broadly of uniform character. they and the street comprise a single early 19th-century development. The street does not appear on William Custance’s plan of Cambridge of 1798, and the building of the terraces in 1821-2 (Cambridge Chronicle) give the terminal date for the formation it…. 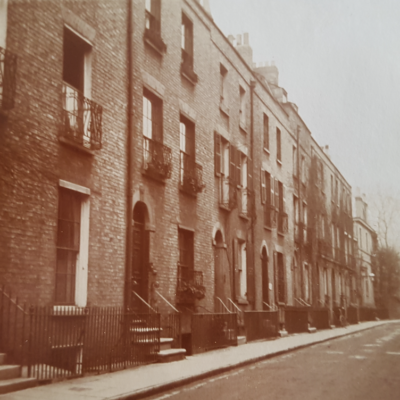 Fitzwilliam Street comprises well-proportioned unpretentious houses designed for the professional classes and is of note as a product of one period, the third decade of the 19th century, surviving without substantial alteration or decline in status.